Two hexaploid species of Solanum sect. Solanum are present in Africa: Solanum scabrum and S. nigrum. Solanum scabrum is a widely cultivated species and is used as a leafy vegetable, as a source of medicine and as a source of ink dye. In previous studies a wide range of morphological diversity has been reported in this species and in some studies subspecies have been proposed. Subspecies are also recognized in S. nigrum. However, it has not been established whether or not the morphological differences are reflected at the genomic level. The present study applies AFLPs to study the genetic diversity in S. scabrum and its relationship to geographical provenance, morphological differences and the possible existence of subspecies within S. scabrum and S. nigrum. The data obtained were analyzed with cluster analysis (using UPGMA and NJ). The results indicate that the genetic variation within S. scabrum was higher within accessions than between accessions. Accessions did not cluster according to their geographical provenance, indicating that accessions from different geographical areas were not significantly different genetically. The clustering reflected neither morphological differences nor domestication status (cultivated or wild). The morphological differences exhibited by S. scabrum could be due to selection by farmers for different plant types. The AFLP derived clustering pattern did not segregate the subspecies recognized in S. scabrum and S. nigrum into separate subclusters. Two hexaploid species of Solanum section Solanum have been reported in Africa: S. scabrum Mill. and S. nigrum L. Solanum scabrum is probably the most important indigenous leafy vegetable in section Solanum. It is widely cultivated throughout the African continent (Edmonds and Chweya 1997; Edmonds 2006; Focho et al. 2002; Fontem and Schippers 2004). In particular, it is extensively cultivated in Cameroon and even exported from there to Nigeria and Gabon (Fontem and Schippers 2004). Farmers in most part of West Africa prefer S. scabrum because of the potential for intercropping and multiple harvesting per cropping cycle, the availability of market chains, the low pest control requirements, and the low input requirements. Farmers use a set of morphological characteristics as criteria, based on which certain types are selected for cultivation (Focho et al. 2002; Fontem and Schippers 2004). The centre of origin of S. scabrum is probably in West Africa (Bukenya and Hall 1988; Edmonds in press; Focho et al. 2002; Fontem and Schippers 2004; Olet, 2004) and the species was first domesticated in Africa (Lester and Daunay 2003). In terms of nutritive value, S. scabrum has a higher protein content in its leaves than other leafy vegetables in section Solanum (Jacoby 2003). Although leaf yield may be influenced by diseases (Fontem et al. 2003), generally S. scabrum yields 7–27 t/ha (Fontem and Schippers 2004), which is probably the highest in section Solanum. Solanum scabrum is susceptible to some crop diseases caused by fungi, bacteria and nematodes. Some cultivars of S. scabrum have been reported to be susceptible to late blight caused by Phytophthora infestans (Mont.) de Bary (Fontem and Olanya 2003; Fontem and Schippers 2004; Fontem et al. 2004). The importance of S. scabrum goes beyond its use as leafy vegetable as it is also used for medicinal purposes, and as a source of fodder and ink, and it provides income especially for women (Fontem and Schippers 2004; Schippers 2002). While growing accessions of the cultivated forms of S. scabrum for the present study, we observed that they could be divided into two main groups based on their morphological and habit differences. Group 1: tall plants (1.5–2 m high), characterized by a large number of leaves, fewer and widely separated inflorescences, a small number of flowers/fruits per plant, taking a longer time to flower. Group 2: shorter plants (<1 m) with a lower number of leaves, more and closely spaced inflorescences, a larger number of flowers/fruits per plant, and flowering earlier than group 1. Olet (2004) and Olet et al. (2006) found also morphological differences between the wild and the cultivated forms of S. scabrum and proposed the recognition of two subspecies, subsp. scabrum and subsp. laevis Olet. The latter represented the wild form of S. scabrum, previously incorrectly thought to be S. nigrum in Uganda (Olet et al. 2005; Olet et al. 2006). Individuals of subsp. laevis were morphologically comparable to individuals of our group 2. Morphological diversity in S. scabrum has also been reported in Cameroon (Focho et al. 2002; Fontem and Schippers 2004). However, it has never been established to date whether or not these morphological differences are also reflected at the molecular level. There is also a need to understand the level of the genetic diversity within the cultivated forms from different geographical areas and between the cultivated and the wild forms. 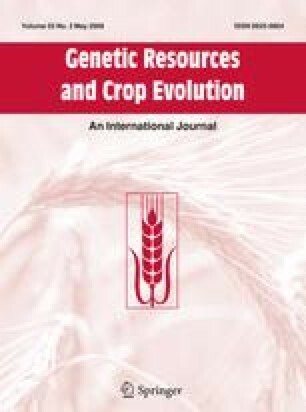 This knowledge can be important in order to choose materials for conservation of genetic resources as has been done in other crops (Caicedo et al.1999; Muluvi et al. 1999; McGregor et al. 2002; Lanteri and Barcaccia 2005; de Vicente et al. 2005). Within the second hexaploid species, S. nigrum, two subspecies have been recognized, namely subsp. schultesii (Opiz) Wessely (with villous pubescence with glandular hairs) and subsp. nigrum (glabrescent). The latter is the only subspecies found in Africa (Edmonds 1979a; Edmonds and Chweya 1997; Hawkes and Edmonds 1972). Some authors (Dehmer 2001; Henderson 1974; Olet 2004) found no evidence for subspecies in S. nigrum accessions from Australia, Europe and Uganda. However, Gbile (1986), suggested that differences in habit (procumbent against erect) and style position with respect to the anthers could be used to recognize two subspecies in the African material of S. nigrum. The current study was designed to: (1) establish, using Amplified Fragment Length Polymorphism (AFLP) markers, whether or not the morphological differences used to recognize two S. scabrum subspecies are supported by molecular data, (2) examine the genetic diversity of S. scabrum accessions and its implication for genetic conservation, and (3) examine the genetic relationships between the African and European S. nigrum and the support of molecular data for the existence of subspecies in African S. nigrum. Newly collected seed samples for this study were obtained from Africa as part of our study of revising the representatives of Solanum section Solanum in Africa. To these samples accessions collected from other geographical areas and collected from Africa before 2001, kept at the Radboud University seed bank, were added. All plants were raised from seed and grown under glasshouse conditions. Forty eight accessions were used (26 of S. scabrum, 16 of S. nigrum, five of S. opacum A. Braun et Bouché and one of S. dulcamara L.), each represented by principle in three individuals identified by letters A, B and C. In a number of cases, the DNA sample of one of the individuals proved to be unsuitable for AFLP analysis, and only two individuals were used. Table 1 lists the accessions used: column 1 gives the Radboud University seed bank accession number and column 2 presents the code used in our study which ties each individual to a particular species and/or subspecies. Column 3 and 4 list the name of the accessions as provided by the seed donor and the names given to each accession after our identification based on the morphological characteristics described by Edmonds and Chweya (1997) and Olet (2004). Country of origin is listed in column 5. Nomenclature follows Edmonds and Chweya (1997) and Olet (2004). Forty milligram of leaf material from each individual was collected in a 1.5 ml Eppendorf tube that was immediately immersed in liquid nitrogen. DNA was isolated using a Promega kit, dissolved in 100 μl DNA hydration liquid provided and stored at –20°C. Concentration of DNA was determined using a spectrophotometer and the quality was checked by electrophoresis on a 1% agarose gel. We used 0.5 μg of DNA for AFLP analysis. AFLP was performed according to Vos et al. (1995) with some modifications. Genomic DNA restriction was achieved using EcoRI and MseI restriction enzyme and pre-amplification was performed using EcoRI+A and MseI+C primers. Pre-amplification products were diluted 50 times in 10 mm Tris (pH 8.0) before selective amplification. Selective amplification was done using a D4 dye (Beckman Coulter) with labelled EcoRI primer and unlabelled MseI primers, both primers with 3 selective nucleotides i.e. EcoRI+AAC/MseI+CAC and EcoRI+ACC/MseI+CAT. Selective amplification products were diluted 10 times in Sample loading solution (SLS, Beckman Coulter). Two microliters of this dilution were added to 33 μl of SLS buffer containing 0.2 μl of CEQ DNA size standard 600 (Beckman Coulter). Resulting fragments were analysed using a Beckman Coulter 8000™ fragment analysis system. AFLP bands at each locus were scored as binary characters. The Nei-Li genetic distances between the Operational Taxonomic Units (OTUs) were analysed using the Unweighted Pair Group Method with Arithmetic Mean (UPGMA) and Neighbour Joining (NJ), and the phylogenetic relationships between species were reconstructed with Maximum Parsimony (MP) methods. All analyses were performed using PAUP version 4.0 b10 (Swofford 2001). For the NJ and MP analyses Solanum dulcamara was used as an outgroup. Jackknife analyses (10,000 replicates) were run with both NJ and MP settings. EcoRI+ACC/MseI+CAT and EcoRI+AAC/MseI+CAC primer combinations produced 175 and 273 polymorphic bands, respectively. Table 2 presents the number of bands and the percentages of polymorphic bands recorded for each species. Solanum nigrum recorded the highest level of polymorphism (91.7%) followed by S. scabrum (86%) whereas S. opacum produced the least (64%). In both distance methods (NJ and UPGMA), three clusters were formed, each representing one of the three hexaploid species involved in this study, with Jackknife values 70–93% (Fig. 1). Cluster I comprised all accessions of S. scabrum including the two accessions A1031scab and 95125scab of the wild form that were considered to be S. nigrum in Uganda, but re-classified to subsp. laevis of S. scabrum by Olet (2004) and Olet et al. (2006). Only the accession 99023A/Bscab from Ghana was supported as different from the other S. scabrum accessions (Jackknife value 98%). Individuals and accessions within cluster I showed a great variation. The majority of individuals did not cluster according to their accessions, neither according to the two morphological groups we identified (tall against short) nor their geographical provenance. The most heterogeneous accessions were A3053scab, A1162scab, A1136scab, A1154scab and A3483scab. Individuals of these accessions did not cluster to their respective morphological groups or geographical provenance [East and West Africa, South Africa, India, Indonesia, and Argentina (Table 1)]. Accessions also did not cluster according to Olet’s proposed subspecies (Olet et al. 2006). The topology shows extremely short branches between subgroups and long branches within the subgroups, and these groups are supported by Jackknife values below 50%, and thus collapse in a Jackknife consensus tree. Cluster II was made up of S. nigrum accessions. Individuals in this cluster also did not cluster according to their accessions or according to their geographical origin (Africa, Argentina, El Salvador and Europe), nor to the formally recognized subspecies (Edmonds 1979a; Edmonds and Chweya 1997; Hawkes and Edmonds 1972) or to the morphological differences suggested by Gbile (1986). Even the accession A3480Bnigrsch that displays an extremely long branch due to a large number of unique bands (Fig. 1) was actually not significantly different morphologically from other S. nigrum accessions. Cluster III was made up of S. opacum. Contrary to the clustering in clusters II and I, individuals in this cluster generally clustered in their respective accessions. The topology of an UPGMA tree, a Maximum Parsimony 50% majority rule and a strict consensus trees (trees not shown) was similar to that of the NJ tree at the species level. Solanum scabrum and S. opacum were supported by 84% and 92% MP Jackknife values, respectively, but S. nigrum by only 54%. The sister group relationship between S. scabrum and S. nigrum is supported by 82% MP Jackknife support value. Our study supports the differentiation of the three hexaploid species S. scabrum, S. nigrum and S. opacum. At the species level this is in line with other studies where morphological data have been used (e.g. Edmonds 1979b; Symon 1981; Edmonds and Chweya 1997; Henderson 1974) and with respect to S. nigrum and S. scabrum our results are similar to those of Dehmer (2001), Dehmer and Hammer (2004) and (Olet 2004). Molecular markers (AFLP) have been used successfully to elucidate genetic diversity within crops and their wild relatives, and between accessions of cultivated or semi-cultivated plants from different geographical or ecological areas, and as basis for selection and for conservation of genetic diversity ( Dehmer 2001; Hammer et al. 2003; Lanteri and Barcaccia 2005; Mace et al. 1999; Muluvi et al. 1999; McGregor et al. 2002; Perera et al. 1998; Potokina et al. 2002; Shan et al. 2005; Vergara and Bughrara 2003; de Vicente et al. 2005). The present study applies AFLPs to study the genetic diversity in S. scabrum and its relationship to geographical provenance, morphological differences and the possible existence of subspecies. The clustering pattern exhibited by S. scabrum individuals in this study indicates that the genetic variation is higher within accessions than between accessions. The lack of clustering according to geographical provenance is an indication that accessions from different geographical areas (East and West Africa, South Africa, India, Indonesia, and Argentina) are not significantly different genetically either. A similar clustering pattern was reported between Ugandan, Indonesian and European material (Olet 2004). In the present study, the clustering pattern also did not reflect the reported morphological differences. The lack of congruency between morphological and genetic differences suggests that the morphological differences can be explained by selection for different plant types. Solanum scabrum is the most intensively cultivated leafy vegetable in section Solanum, and as such has undergone selection by farmers. Leaf size, stem wing and stem branching characteristics were taken as basis for selection (Fontem et al. 2003) and these are actually more pronounced in the tall form of this species. The shorter forms of S. scabrum produce more fruits than the taller ones. This type is selected for the number of fruits rather than leaf production, the fruits being used as source of dye and ink (Fontem and Schippers 2004). Human selection has been shown to lead to distinguishable morphological groups in other crops as well. Selection for stolon diameter and total stolon length in white clover (Trifolium repens L.), a forage legume in the UK, resulted in four phenotypes (Collins et al. 1997). Portis et al. (2005), using AFLPs, differentiated cultivated cardoon (Cynara cardunculus L. var. altilis DC), that is selected for its fleshy leaves, and globe artichoke (C. cardunculus L. var. scolymus (L.) Fiori), that is selected for its immature inflorescence. The shorter cultivated form of S. scabrum differs from the wild form (described by Olet et al. (2006) as S. scabrum subsp. laevis Olet) in a number of characteristics (angled, winged stems, with prominent ridge teeth, peduncle posture at right angle to the stem, a broader range in flower and anther colour, persistent fruits). However, the shorter cultvated form is more similar to the wild form than the tall cultivated form, and it could be hypothesized that the shorter forms were the first to be selected from wild populations, with the taller types developing in a later stage from the shorter forms. This hypothesis is not supported by the AFLP data of the present study because there is no apparent clustering of the wild and shorter cultivated forms. It is likely that the short and tall forms have both been derived directly from the wild form, as a result of bidirectional selection for the production of fruits (as source of ink and dye) and leaves, respectively. Based on the materials used and the results obtained it appears also that there are no significant genetic differences between the cultivated and the wild forms of S. scabrum. The clustering of the two accessions 92115scab and A1031scab with S. scabrum accessions in the present study confirmed conclusions reached by Olet (2004) and Olet et al. (2005) that these were S. scabrum accessions and not S. nigrum. The lack of separation between these accessions and the cultivated forms, however, indicates that there is no evidence for genetic divergence between them, and therefore the subspecies in S. scabrum described by Olet et al. (2006) are not supported by our molecular data. This observation conforms to many other studies ( Coulibaly et al. 2002; Lester and Hasan 1991; Lester and Daunay, 2003; Olsen and Schaal 2001; ) where it was also found that genotypes of cultivated forms did not change much from their wild genotypes, although they do display an increased morphological diversity. This points to the possibility that under cultivation genetic changes are slowed down because both competition and natural selection are reduced, since environmental conditions are kept at an optimum and pests are artificially controlled. Edmonds (1979b) concluded that members of section Solanum are predominantly self-pollinating though natural and cross-breeding takes place. The vast variations shown by individuals of the same accession of S. scabrum and S. nigrum in the present study is not in line with Edmonds’ conclusion. S. scabrum individuals showed a clustering pattern that is similar to that of S. nigrum, and both species show a high percentage polymorphic bands (Table 2). Our study of the morphology of section Solanum species (Manoko 2007) places S. scabrum together with S. nigrum in a group of species with a high proportion of exerted styles, which might be linked to outbreeding. In contrast, the individuals of S. opacum, another hexaploid species included in the present study, did cluster according to their accession number, and the percentage polymorphic bands is lower for this species than for S. scabrum and S. nigrum (Table 2). Interestingly, S. opacum shows only a low number of exerted styles. These observations suggest that S. scabrum and S. nigrum might not be predominantly self-pollinating, explaining the observed variation between individuals of the same accession. Conservation of genetic resources should start with characterization of the diversity. Characterizations based on markers that have the potential to provide information on genetic variation like AFLPs may be more informative than morphological characterization. Based on the present study, the genetic diversity in S. scabrum is low. Possibly, higher variability could be found in West Africa where the domestication presumably started and especially in Ghana as indicated by the supported isolated position of accession 99023scab. It might be desirable therefore to undertake in situ conservation strategies in these areas. AFLP markers did not support the two formally recognized subspecies in S. nigrum although representatives of both subspecies were included in our material. This observation gives us reason to believe that hair characteristics have a low taxonomic value at the subspecies level in section Solanum. This conclusion is in agreement with Dehmer (2001) and Dehmer and Hammer (2004), and we have also observed similar results within S. villosum Mill. (Manoko 2007). Also Edmonds and Glidewell (1977) did not find support for subspecies within S. nigrum using acrylamide gel electrophoresis of seed proteins. Phylogenetically, there is no clear pattern to indicate the origin of glandular hairs in S. nigrum. The distribution of individuals with glandular hairs (nigrsch) all over the majority rule consensus tree (not shown) may be taken to suggest that glandular hairs have been gained and lost several times. Similarly, we do not find support for the subspecies proposed by Gbile (1986), based on habit and on the exertion of the style beyond the anthers. The S. nigrum clade has a lower (54%) MP Jackknife supports value although this group exhibits 93% Jackknife support in the NJ tree. This indicates that there is a relatively low number of synapomorphic bands and a relatively large number of autapomorphic bands. Olet (2004) found that S. scabrum and S. nigrum were not close relatives. The present study shows that the two are closely related hexaploid species, which conforms to the conclusion of Dehmer (2001) and Dehmer and Hammer (2004). They are also sister species in the MP analysis (82% MP Jackknife support). This may suggest that these allohexaploid species share at least one of their parents, which is supported by crossability studies by Heiser et al. (1965) in which fertile hybrids with 91–95% pollen stainability were produced between S. scabrum and S. nigrum. Based on the current study the following conclusions can be drawn: (1) S. scabrum shows morphological variability but low genetic variability between accessions from different geographical regions. We have argued that the observed morphological differences are mainly caused by human (bidirectional) selection. (2) Individuals from accession 99023scab from Ghana are genetically separated from all other accession of S. scabrum. This suggests that more genetic diversity can likely be encountered if extensive sampling is done in West Africa where the species is said to have its centre of genetic diversity. (3) S. scabrum and S. nigrum are two closely related hexaploid species. (4) No support of subspecies was found in S. scabrum and S. nigrum, and hair type and characteristics of stem and leaves are not reliable taxonomic characters at the subspecies level. The authors acknowledge funding for this project from Nuffic through MHO-ENVIRONS program run together between the University of Dar es Salaam and Radboud University Nijmegen, and the Faculty of Science Radboud University Nijmegen. They also wish to thank Mr. Jelle Eygensteyn for his assistance during AFLP analysis on the Beckman machine.